i've been asked to help plan a baby shower for a friend, ally. she's expecting her very 1st girl! (she's got two little boys already). i was told to keep it simple since we're so short on time. (the shower is going to be held on january 2nd...so...we're pressed for time to come up with a theme and create an invite to send out). with a color palette to guide me and my realization that this is a "winter shower", here's a peek at my "brain-storming/creativity process" of creating the invites and ultimately...the final theme for the shower. 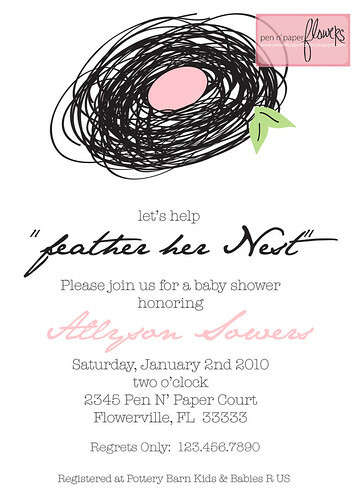 thanks to @littlepinkbox on twitter, i first came across THIS invite from tinyprints with the whole idea of hosting a "feathering her nest" baby shower. (where have i been because apparently this has been done before but this was completely new to me?). the original invite from tinyprints had a "masculine" feel to them so i had to "girl-ify" them. just a little squiggly nest i created in adobe illustrator & i swapped out the blue egg for a pink one. and all of the requested color elements were used. so i created this - also using adobe illustrator. omgoodness. is the little sheep not just the cutest thing you've ever seen?! remember...the scarf is because this is a "winter shower" but you could easily remove it for a "spring shower"? i'm so proud of that delicious little creature i created. i could eat it up. i had visions of doing everything "cotton" related - from decor to favors. "how about pink cotton candy as favors"? GET. OUT. - she's using the penelope bedding from potterybarn kids. 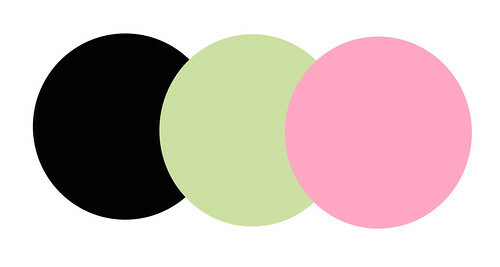 - THIS white vinyl wall cling is going in the nursery. 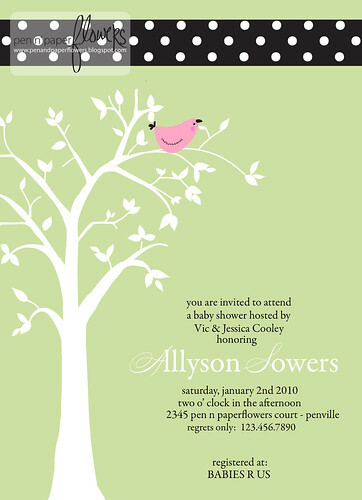 i went right to work in creating yet a 3rd invitation to include the white wall cling & incorporating the birds/polka dots from the aforementioned bedding. i've received "approval" to place the order. thanks for all of your help vic. (and ally). i'm so completely satisfied with how they all turned out. 3 VERY DIFFERENT shower themes...all from one color scheme! now...menu planning, decorating strategies & favors await! 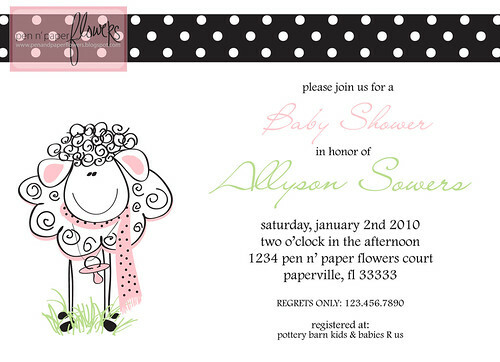 Jess, these invites are so precious. Your creativity is so inspiring. I would love to learn how to design. Thanks for sharing!